I was 17 in the fall of 1970, and tho I'd started college I was unformed and unsure of myself and where my life was taking me. I'd had my first taste of New York over the summer and remained undeterred in my obsession over it, despite its obvious decay. Absurdly, I began my higher learning as an Accounting major--something I had as little aptitude for as interest in. But DeAnza Junior college was a five minute walk away, and what else was I going to do? What occupied my life, as it always had, were my own cultural obsessions--largely kept private even from most of my brethren. I was as addicted to network TV as I ever was; Carol Burnett, Doris Day, the new Mary Tyler Moore, Laugh In., Hawaii Five-O, Mission: Impossible; these and many others were my nightly sustenence. That, and of course, my OCRs--those discs of aural Bway history I cherished above all my possessions. It was obvious how out of step I was from my generation, caring so little about The Beatles, The Stones, The Who or the whoever--tho I was coming around on some pop, dare I say even rock music, via my best friend, Bill--who had a very interesting ear (no one I've ever known has really listened to music as carefully as he and I have.) Still, Bway was my métier, and I had only just begun my scholarship of its recorded history, still shy of learning a thousand wonderful songs. But as much as I was a musical comedy nerd, I was never an operetta fan. I couldn't go that far. Operetta was a complete turn-off to me (those shrilly sopranos!) the embarrassing relative of my true love: musical comedy. Aside from the arioso quality of the music, the libretti are mostly ridiculous, or "folksy" in a decidedly antediluvian way. It was best served up in parody, like Lucy's gypsy with her blacked-out teeth in a bit from I Love Lucy; or later the whole of Rick Besoyan's Little Mary Sunshine. Thus, the Song of Norway did not call to me that November--or ever after. During '69 and '70, Hlwd and American cinema changed so radically, so quickly, that it felt more like decree than evolution. Suddenly studio films were darker, grittier, rougher; much of their previous glamour, color and romanticism stripped away. The new pictures felt cold and nihilistic--a reflection of the zeitgeist, yes--and how that distressed and disappointed me. I simply hated M*A*S*H, was bored senseless by Five Easy Pieces, dreaded every moment of Love Story. But neither was the remedy something so hopelessly old-fashioned and deaf to the times, to say nothing of ineptly made--which anybody could tell just from the poster. And so I never had any curiosity or desire to see Song of Norway until now. Most of you have probably not seen it either, for it disappeared after initial release and has scarecely been spoken of since. With good reason. Song of Norway came from California. Edwin Lester had started the Los Angels Civic Light Opera company in 1938--a time when touring Bway companies rarely crossed the Rockies. Opening with that old warhorse, Blossom Time, Lester's first season (Student Prince, New Moon, Roberta) made his taste clear. "Light Opera in the Grand Opera manner." Joined the following year to Homer Curran's San Francisco CLO, the outfit kept operetta thriving on the West Coast well into the '40s, when Bway producers noticed the numbers to be had out there, and started jockeying for slots, and taking over CLO seasons. Lester had greater ambitions than being a booking agent; developing original productions as well and exporting them East. Seeing potential in the works of Edvard Grieg, Lester hired a pair of Hlwd composers, Robert Wright & George (Chet) Forrest, to adapt Grieg's melodies into arias and ballets. They did so well that this became their specialty. Unfortunately they had far more misses than hits, with Kismet their most seamless and convincing marriage. 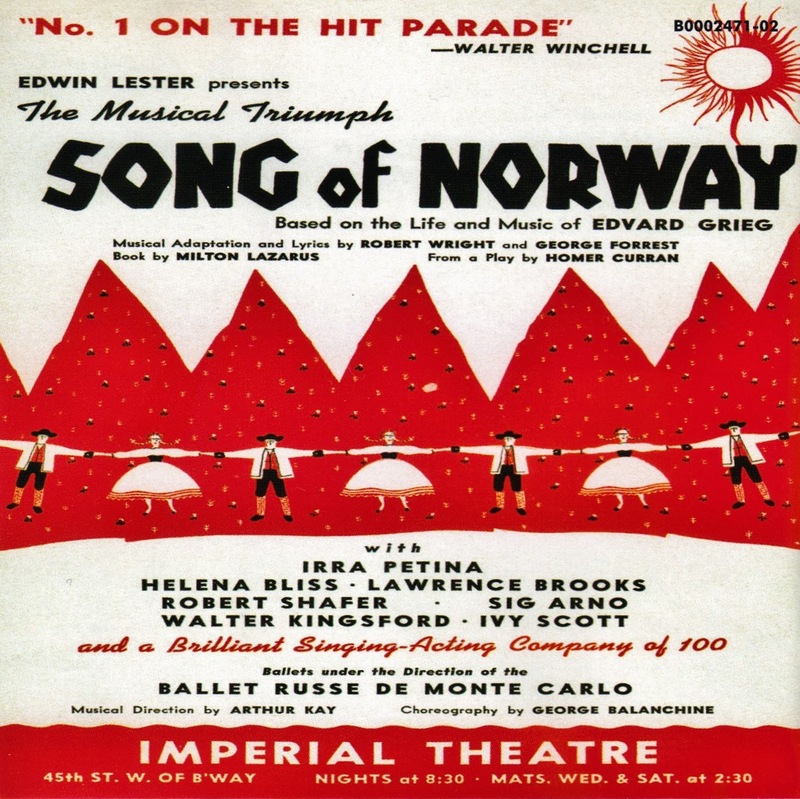 But Song of Norway was a mammoth hit for them as well (at its closing the 5th longest running musical in Bway history) and revived by CLO and Jones Beach into the '60s--by which point operetta hit the brick wall of cultural expiration. Naturally someone would decide the time was now right for a Cinerama film treatment, 25 years after opening on Bway--of a show thought outdated even in 1944. Tellingly, not a studio film, but an independent production financed by Cinerama Intl & ABC explains the impetus behind this decision in midst of the tumult of the late '60s. A misconstrued attempt to tap into The Sound of Music phenomenon without understanding the reasons for its success, or the lessons of its execution. As if mountains and music and a rousing sense of nationalism (in a harmless neutral country) were all that was needed for blockbuster success. How'd that turn out for them? Between the spontaneous chirping of village folk, Stone infuses some action: Grieg runs a potential patron off the road in a horse & buggy chase that references Ben Hur, and minutes later a runaway carriage, loaded with festival-goers, plunges into a lake. Those Norweigan roads are dangerous. And in place of the showpiece ballet set to the Peer Gynt Suite, we get some of the hoariest animation ever overlaid on live action--cartoon "trolls" terrorizing little blonde children. There's nary a person in the film who isn't blonde. But most disconcerting is a maddening lack of establishing shots. There are endless pics of fjords and peaks--postcards on parade--right from the top of the credits, and often within the musical numbers when it's clear there's little to watch in their performance. (The anthemic "Song of Norway" is the most obvious example.) But moving from scene to scene, with jumps in time and even location, the transitions are blunt, often disorienting until some dialogue clues us in. You'd think a jump to Rome would at least be suggested by some visual cue. But no. Being the story of a composer, the narrative allows for a natural presentation of music; the author composing, rehearsing, presenting his music to the public. 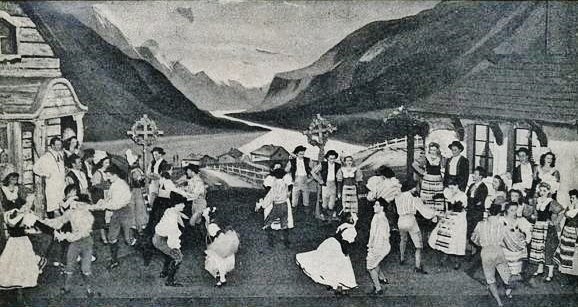 But half the score is sung by the local folk, rushing over hills in native costumes, already school-versed in Grieg--but how? And why all these children? None of these characters have children, only parents; so why are kids popping around every corner? "Freddy and His Fiddle" is infected with tykes cavorting on grassy hilltops, in any number of blatant steals from The Sound of Music. 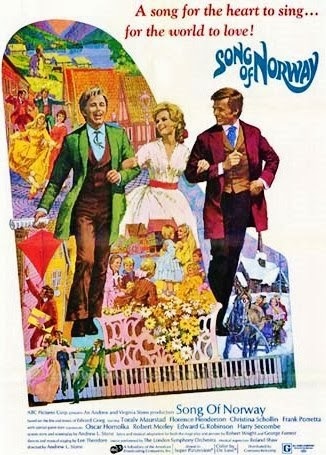 Grieg's cousin and later wife, Nina enters the story educating another brood, prefacing her "A Rhyme or a Reason," by taking the kids into town, "And then you can see there's a reason for everyone and everything." 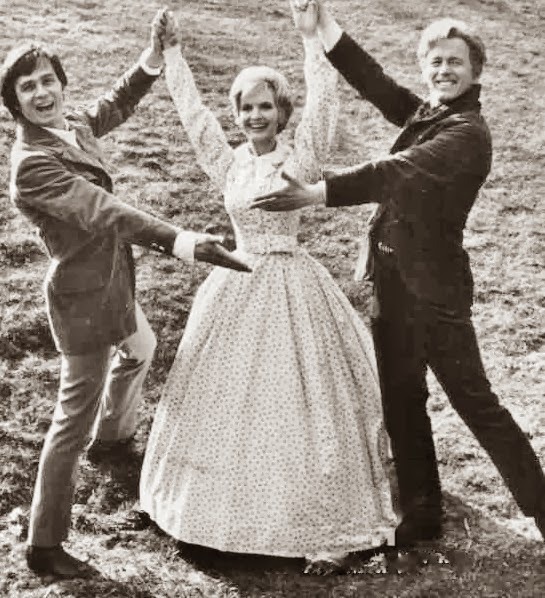 A fairly ridiculous claim that Florence Henderson puts to song; a would-be "Do Re Mi," trading Salzburg for Odense, and set to a tune closer to a dirge than Rodgers' infectious march. The contrast typifies everything between the two films. There's a lavish church wedding as well, tho SOM has nothing so hilarious as Grieg literally reading a letter from his first love, as he's walking down the aisle, telling him she's now free of her father's will, still unmarried and very rich. And so ends the first half. (who looks a lot like Reese Witherspoon) in her only English language pic. Therese believes in Grieg so strong she sacrifices their budding romance to advance his career; her father funds the young musician in exchange for her dropping all contact with Edvard. Papa is that old coot, Robert Morley, who along with Oscar Homolka, Harry Secombe, and Edward G. Robinson constitute the film's celebrity cameos, the latter, of all things, as a piano salesman. The star himself, Grieg, is played by everybody's favorite: Toralv Maurstad; a strawberry blonde native Norweigan, whose turn here never brought him to Hlwd. Not that he isn't pleasant company, as is Frank Poretta's Nordraak. And then there's the poor man's Julie Andrews: Florence Henderson. By default, the film's one marquee name, she plays Nina, Grieg's cousin and later wife, who makes her own sacrifice and allows hubby to pursue his career under the patronage of his first love, Therese. 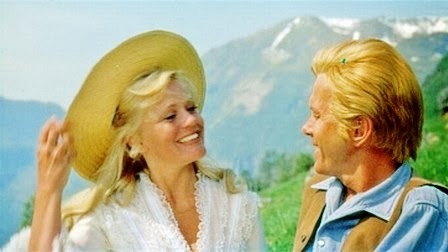 For a climax the film has nothing remotely close to fleeing Nazis; Grieg thanks Therese for her help but returns home to his wife. Cue music and final panoramic vistas. Norway! Makes you wonder if it wasn't half intended as a commercial from the Tourism Bureau. Trouble here is that the camerawork is rather tepid. Davis Boulton was a cinematographer of minor repute (The Haunting; Children of the Damned) who was equal to the disappointments provided by every department on this production. Classical motifs don't necessarily make good songs. "Strange Music" is touted as one of the best in operetta's canon, but it doesn't strike me that way; the tune forced to stretch over Grieg doesn't have the requisite interest for a 24 bar song. Ironically the bridge, entirely the invention of Wright & Forrest, is striking, sounding like a real song--you can feel how restrained they were by Grieg. (They did far better with Borodin, if you ask me.) I never got around to listening to Song of Norway until a decade or so ago, and after a listen or two have kept it on the shelf. So only now have I had repeated exposure to it, and I can't say I've been missing much. None of the songs are equal to the pure patches of Grieg that serve the ballets. 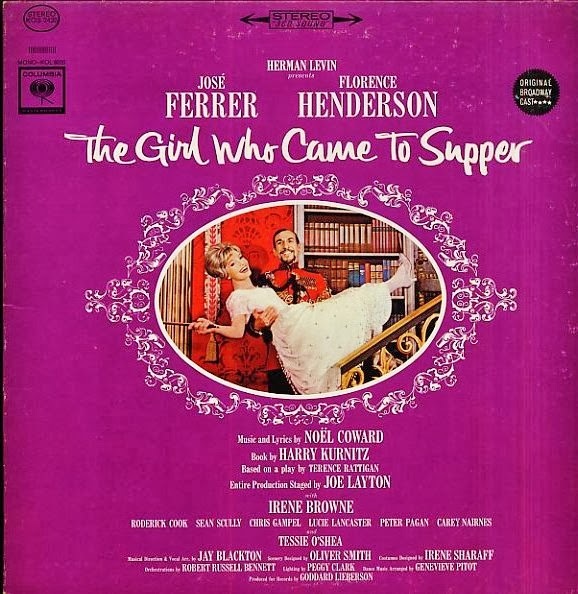 Its likely I first knew the A minor concerto from its cameo in the middle of Frank Loesser's "Rosemary" from How to Succeed. After those first 16 bars I still can't stop myself from hearing Robert Morse segue back into "...not to be missed." Musicals can be so culturally edifying. Noel Coward's bid to write the next My Fair Lady (based on Terence Rattigan's Sleeping Prince play, better known to film buffs as MM's Prince & the Showgirl) It lasted 15 weeks and never even entered the strawhat/ amateur market. But Henderson's greatest fame would come from playing Mom to a brood of saccharine suburban kids in The Brady Bunch--a Friday night sitcom on ABC for 5 seasons, and one, which even at age 16, I couldn't stomach (perhaps a sign of my growing maturity or at least a slight curing of taste). Later decades would reduce her to pitch-woman for elder care products, another sad comparison to the careers of Cook and Jones. 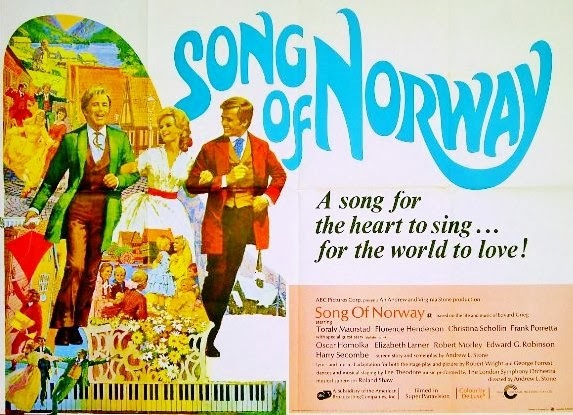 Uninvited by Hlwd, Song of Norway would be her film debut and the only screen musical she would ever make. Michael Medved, who makes a career out of Hlwd's worst movies, called her "the Peter Frampton for the Geritol set." She deserved better. You can't say the same about the film. It opened, in a case of severe optimism, as a Roadshow attraction, first in New York at the Cinerama Theater; and eked out a 21 week run before a quick playout in grind houses. It earned a fair $4,450,000 in film rentals, tho far below hopes, and to little public affection. But the independent production with no stars and not a single set built, cost far less than the bloated studio pics and even saw a modest profit. Song of Norway may have reeked of obsolesence, but there were still plenty of folk in 1970 more attuned to Lawrence Welk than Led Zepplin. Change was flying fast & furious at the turn of the decade. I was young enuf to absorb most of the cultural shocks, yet old enuf to lament the disappearing standards. Tho I had finally experienced The Great White Way that summer, I determined to ignore any signs of its decline in either quality or influence. I invested in an subscription to Variety. followed every morsel I could about the new season. The offerings that fall were again slim: but a new Bock & Harnick show was always promising, as was any by Richard Rodgers. Unfortunately Two by Two was a Borscht Belt take on the Noah fable, run rampant by Danny Kaye's showboating, and The Rothschilds did Jews no favor by having the future financial barons of the Western world angrily singing, "We Want Everything." (It also proved the undoing of Bock & Harnick, who despite another exquisite score, never collaborated again.) For me, these would have to wait until next summer. In the meantime I could get up to San Francisco on my own now (usually with Bill), and had season tickets for the CLO. 1970 was a great lineup: 1776, in its first stop of a national tour; Zorba with John Raitt and Chita Rivera; Promises, Promises, with Tony Roberts and one dud: a pre-Bway tryout of a new musical based on the play Teahouse of the August Moon--an enormous hit in the '50s, but one whose appeal I didn't get at all (having just seen the movie that November). The musical, clumsily renamed Lovely Ladies, Kind Gentlemen, didn't help change my opinion, nor survive more than two weeks on Bway. 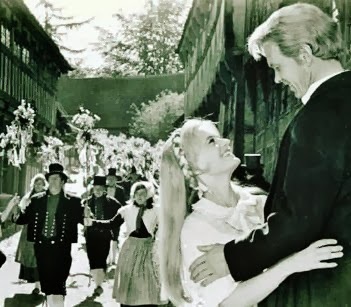 Spring would bring a little more interest, but the season would yield no new musicals that caught the interest of Hlwd. And for the second season in a row. The writing was on the wall: there hadn't been a season that didn't produce at least one tuner sent to Hlwd since 1947--and that was with the overlooked High Button Shoes. The celluloid corpses were stacking up: Camelot, Sixpence, Finian's, Wagon, Charity, Dolly!--not to mention the untested, misguided film originals: Dolittle, Star!, Mr. Chips, Darling Lili. Improbably, among all these, Song of Norway alone made some coin; ironic all the more for being the most backward-looking, ineptly-made of the lot. Welcome to the Seventies. "A Rhyme and A Reason" "Freddy & His Fiddle"